You are using for years now a Vernet Behringer FP drilling machine in line with a HBP band saw? The FP series have been proving their reliability, solidness and ease of operation, but do not integrate the latest technologies, such as fast carbide drilling, milling and layout marking. 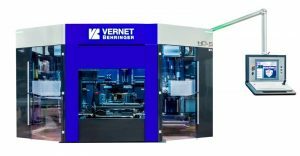 Vernet Behringer has been developing 2 machines able to bring significant added value to your business for a reasonable investment, given that all conveyors, cross-conveyors and the sawing machine itself can be re-used! The HD-SEVO machine, major evolution of the HD-S, is a versatile 3-spindle drilling machine with a CNC controlled clamping assembly with 150 mm stroke. This unique feature opens new possibilities such as milling (long holes, big diameters, slots in right hollow sections), and quick and precise layout marking and part identification with Vernet Behringer’s V-scoring. Innovative technologies make also possible the machining of right hollow sections on all 4 faces. On top of that the machine is equipped with powerful spindle motors especially designed for the use of carbide drills and an automatic extended tool changer for 8 diameters instead of 4 for each unit. It is controlled by our recently launched PRONC23D programming software, more flexible and user-friendly than ever. The HD-XEVO2 brings even more productivity and machining possibilities, thanks to its independent x-axes with 500 mm stroke on all 3 spindles, giving the possibility to simultaneously drill non-coaxial holes in flanges and web, or drill and mark with V-scoring etc. The standard automatic 6-tool changers can be optionally increased to 10 tools for more flexibility. The machine allows carbide drilling and milling numerous shapes at high speed at low running cost thanks to the vibration-free operation. For more information, visit our website www.vernet-behringer.com and contact us to get a customized quote for these machines.